Vegan Eats and Treats! : Overwhelmed With Oranges! A couple of years ago I planted two orange trees and a lime tree. That lime tree went bonanza right away, but the orange trees have been a bit more slow to produce. At least, until this year. I planted two different varieties of oranges, and one of them is still kinda limping along... but - as you can see - tree #2 is going to town! We have SO MANY ORANGES. But, here's the dilemma: they really aren't the best oranges. Alas! Every week, when I go to the farmers market, I allow myself to buy one beautiful, perfect and delicious orange for a snack. It seems so ridiculous to buy oranges when I have so many oranges on my tree that I am literally harvesting off the ground... and yet, there you have it. Our oranges are pretty good - but not very sweet... Pretty much the only way to get through them en masse is by juicing them. I only have one of those little tiny glass juicer thingees, where you have to turn your wrist back and forth a million times to get out 3 tablespoons of juice. When you have giant cardboard boxes filled with oranges urgently awaiting your timely attention, this can seem a bit overwhelming. 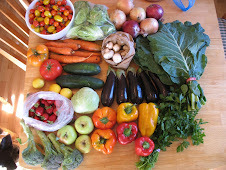 But, due to my absolute dedication to never letting food go to waste, I have tackled this project already a few times this season ... and I"m sure I have many more juice-a-thons in my future. The actual juice is pretty good, but again, not too sweet. I figured out that if I think about grapefruit juice, then it's really good. It's just not as sweet as you'd except OJ to be, but it's a totally passable grapefruit juice. Besides just drinking the juice, I've been trying to use it up in other ways. I took some to a breakfast gathering, I gave some to my mom and dad (who admitted to adding sweetener, fair enough! 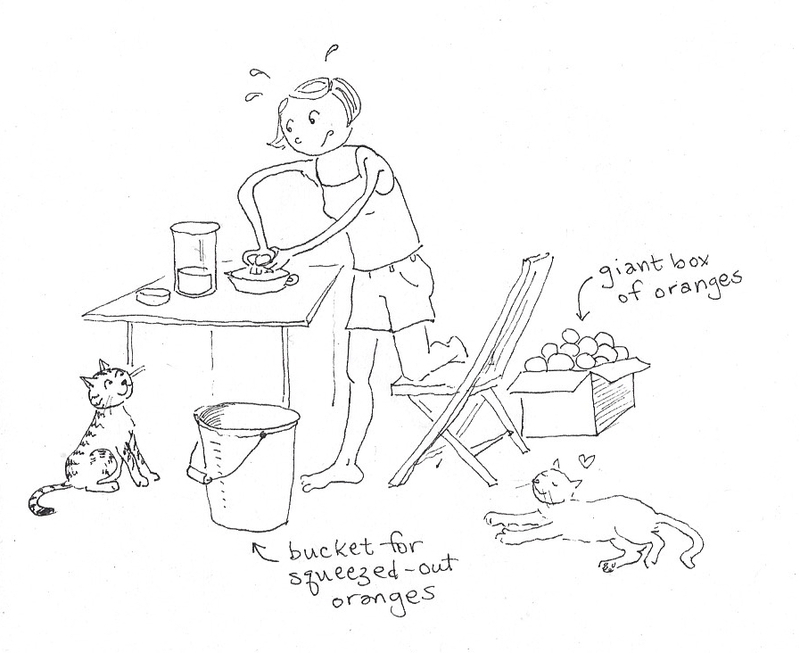 ), and I've been trying to find as many recipes as I can that call for orange juice. In addition to the bowl above, I've made the Orange Chicky Seitan (also from Isa Does It), and lots of various salads with the Orange-Miso Dressing from "Oh She Glows Cookbook." That dressing is really quick and easy and uses up a little big of dressing. The Orange Chicky Seitan came and went without getting photographed - but it was a big hit. Very delicious, not too time-consuming to make, and used up a whole cup of OJ. I think I'll have to make it again soon! I welcome your orange juice ideas! 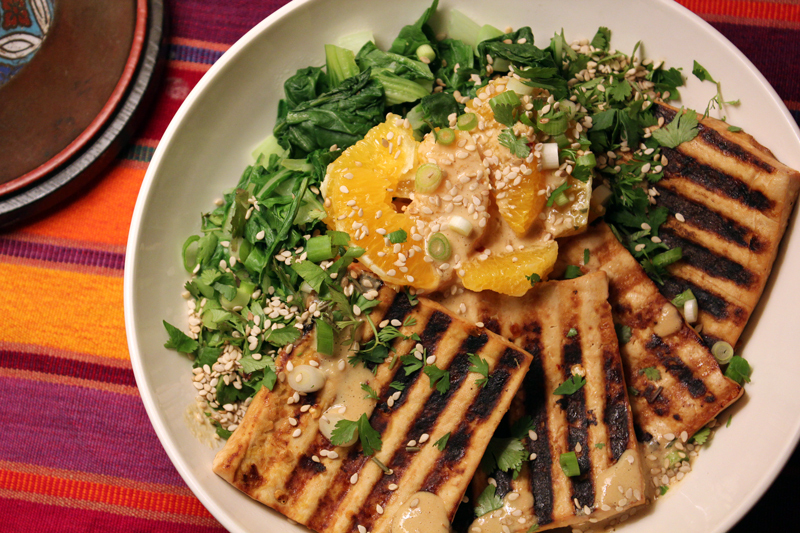 Oh, I love that citrus tahini bowl from Isa Does It! It's one of my favorites from the book. I still haven't made the orange chicky seitan, but I need to do that. Everyone raves about it. For other ideas, you could make a peanut sauce for noodles and dipping and use OJ for some of the liquid. I've also been known to make Easy Baked Tofu with orange juice or lime juice instead of my usual lemon juice. http://cadryskitchen.com/2013/09/04/back-in-thyme-baked-tofu-kale-chip-bowls-with-tahini-dressing/ I'll admit that I like lemon & lime the best, but OJ is good too. Wow! I've never even SEEN an orange tree! Ha! How sad is that? But that's awesome. I love adding half an orange, cut into slices, in my water jug with a little fresh basil and lemon slices! Silk Road Cooking has an awesome recipe for Moroccan Date & Orange Salad. Dates, carrots, oranges, almonds, pistachios tossed with a yummy dressing and served up on a bed of mixed greens. Delicious!! Orange Cake or cupcakes, or Choc-Orange Cake or cupcakes! The Chocolate Cupcakes from VCTOTW have a choc-orange variation. The Chocolate Orange Almond Olive Oil cake from Vegan Chocolate was great - it's an orange almond cake with a chocolate orange glaze. That book also has some Chocolate Orange Sesame Truffles that I haven't tried yet, but have my eye on. For a savory suggestion I recommend Aren't You Glad I Made Crispy Tofu from Chloe's Kitchen. SO GOOD! Your poor wrist from all that juicing! I had one at work and it was great. 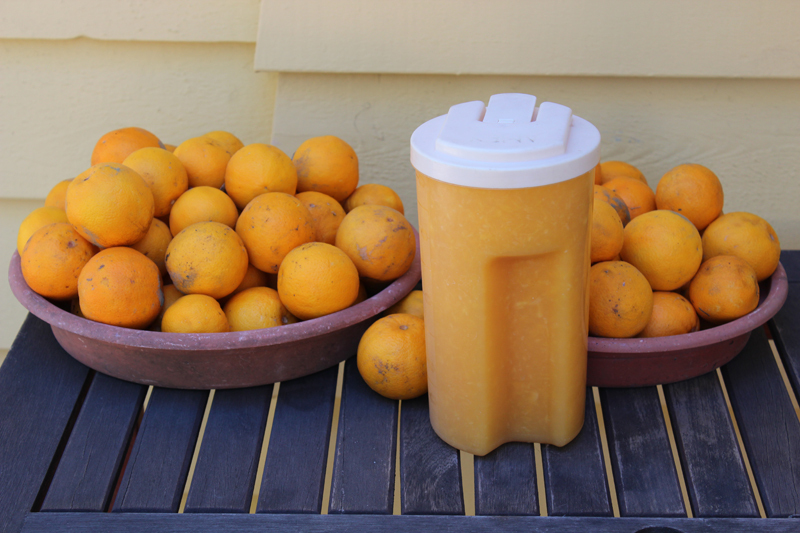 You could juice 50 pounds of oranges in 10 minutes. But I am sure you don't have 1,000 bucks to blow. As for orange suggestions, you mentioned it not being so sweet, like grapefruit. I use to love segmenting grapefruit and tossing it in brown sugar and bourbon. Maybe try that with oranges and serve on top of ice cream. Orange marmalade? You could use a lots of oranges and have gifts to show for your work. How beautiful! My first thought for an orange glut was marmalade - add some warming spices and you have yourself some cute winter gifts ready to hand! Otherwise, I don't know if they're sweet enough to candy and dip in dark chocolate... But I'd be trying that! If you have any that look less juicy, my mum and I used to stick cloves into oranges so they cover the whole skin, and use them as air-fresheners/makeshift pot-pourri (could also make nice gifts as Christmas tree decorations come to think of it). My mum also makes a wonderful mushroom-and-orange risotto from a (non-vegan) cookbook called Trattoria - if you're into it I'll get her to scan it and I'll email it over to you! Marinades, as you suggested, seem to be the best bet. I put some in smoothies, but usually need to add something sweet (like dates). Clean with them! Use them in simmer pots. Slice and freeze a bunch for cleaning garbage disposals. Soak a bunch of peels in vinegar for a few weeks, stain, and use as a cleaner concentrate. 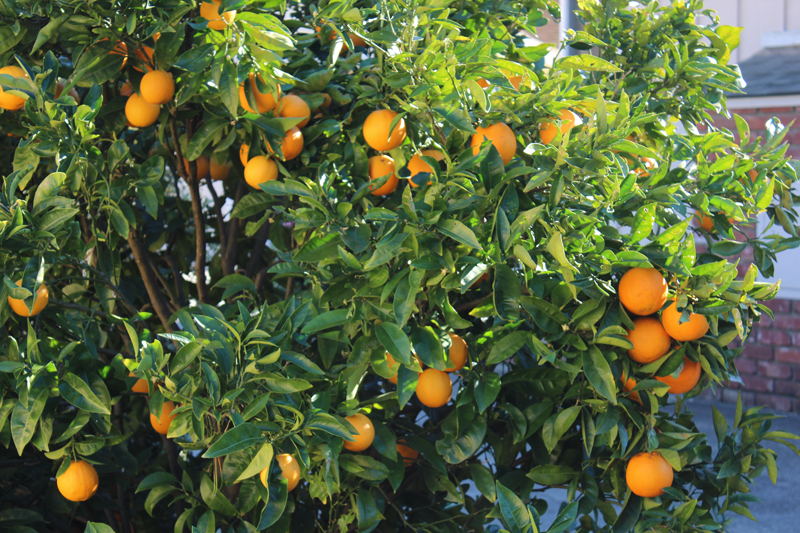 I want a citrus tree like whoa! Even if my fruit isn't the best :). We have a million oranges too! I think slicing them into salad is one of the best ways to eat them. Do you also have a stash of zest in your freezer? I like to throw handfuls onto oatmeal or use them in cranberry-orange bread. Jealous! I live at too high an altitude for citrus (too cold), but I'd suggest mixing the juice into smoothies (where other fruits can add to sweetness if needed) and mixing with some other fruits or juices to make popsicles for the summertime.